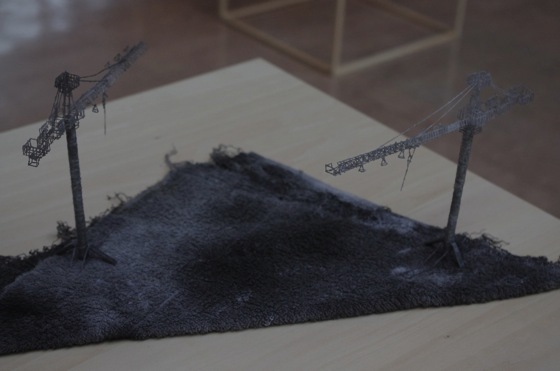 Takahiro Iwasaki is an artist who creates urban landscapes out of everyday objects like the bristles of toothbrushes, bath towels, and duct tape. For an exhibition organized by Kawasaki City Museum and the Open Museum Project, the Hiroshima-based artist created new works as part of his “Out of Disorder” series. 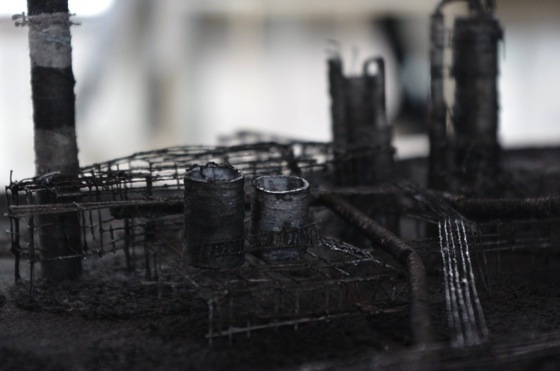 At an artist talk held at the same museum, Iwasaki revealed his thoughts on Japanese industries and cities that went into his Kawasaki series. When asked to create works for this exhibition, Iwasaki traveled up to Kawasaki in search of buildings on which he would base his work. He held an impression of Kawasaki as the industrial backbone of Japan that supported the country in its years of economic growth and manufacturing boom. Driving along the port of Kawasaki (part of Tokyo Bay), Iwasaki searched for the city’s famous industrial landscapes. However, many of the famed factories and refineries were hidden behind “No Trespassing” signs. 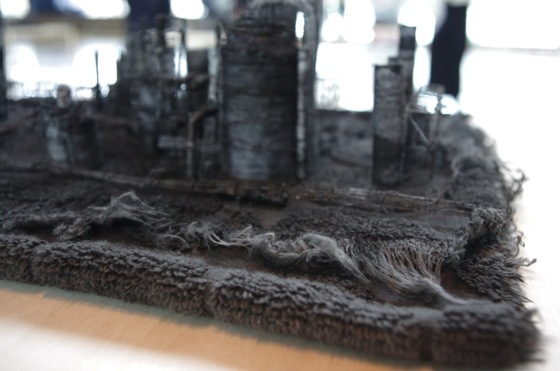 Disappointed, the artist returned to Hiroshima (where he lives and works) without a clear image of the factories. But once he went online and searched for satellite images on Google Earth, he realized that the true facade of the factories that epitomize Kawasaki faces outwards towards the ocean. On the Internet, Iwasaki found exactly what he had hoped to find, and his ideas for the series became more concrete. 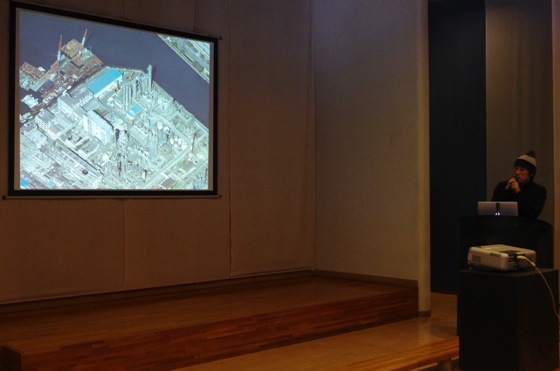 Takahiro Iwasaki giving a presentation on his exhibition at the Kawasaki City Museum. 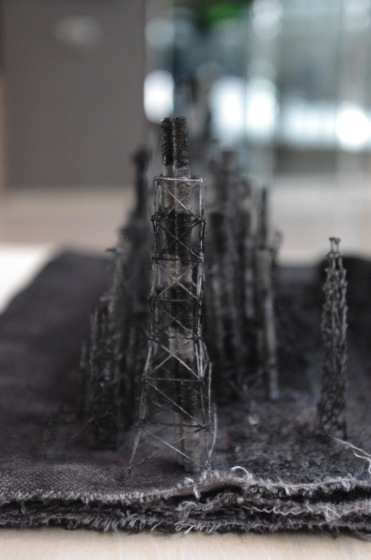 Iwasaki’s Kawasaki City Museum exhibition featured nine pieces of miniature oil refineries and power generation plants with intricate pipings and delicate cranes. Asked how he decided on these nine structures, he explained that the uniqueness of Kawasaki’s factories lies in their location and the different perspectives from which one can observe them: from land via the adjacent highways, on boats from the sea-side of the factories, from the sky on planes that take off from nearby Haneda Airport, and from further above through satellite images on Google Earth. 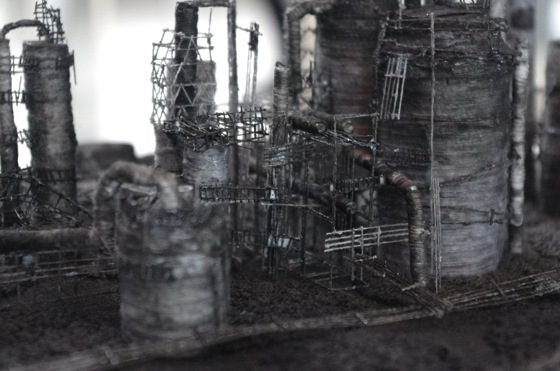 He took in all these perspectives, especially relying on the high definition images that could be found on Google Earth, to make the pieces in this series. 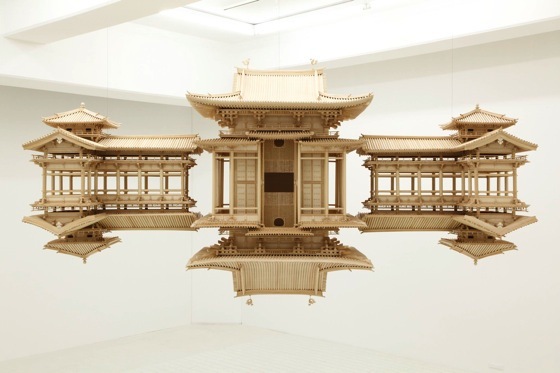 Looking back at his past works like “Reflection Model (Perfect Bliss)” (2010-2012) in which Iwasaki replicated the Buddhist temple Byodo-in in Kyoto, and “Out of Disorder (Cosmo World)” (2011), it is clear that Iwasaki has a penchant for creating complex, realistic constructions. However, his creations are not simply glitzy edifices chosen for their fame, beauty or size. 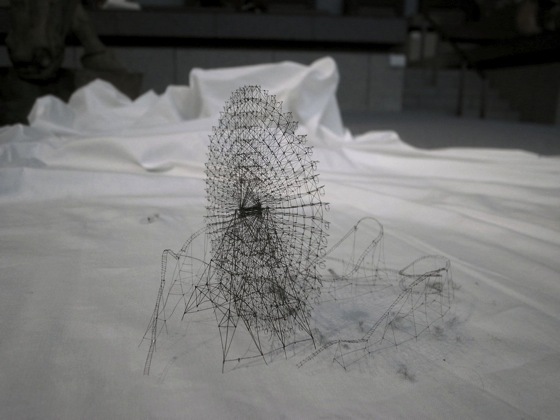 He created “Out of Disorder (Cosmo World)”, for example, because the large Ferris wheel standing empty and silently, when Japan was conserving electricity after the disasters of 3.11 in 2011, made a strong impression on him. 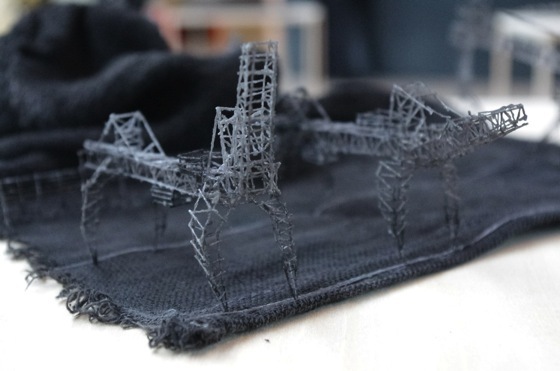 The artist’s “Out of Disorder” series uses cloth fibers, human hair, and at times even dust to meticulously recreate miniatures of actual buildings. 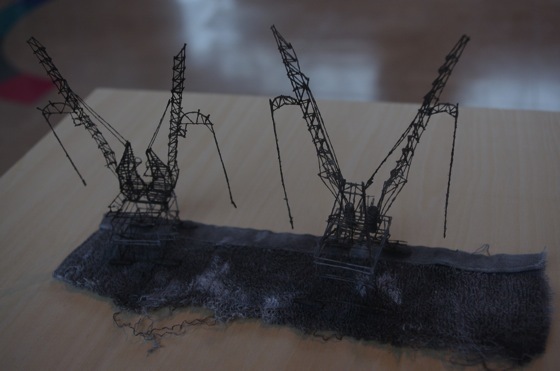 Just as he put much thought into finding the right landmarks for this series, Iwasaki also considered carefully the fabric he would use to build these Kawasaki “Out of Disorder” pieces. 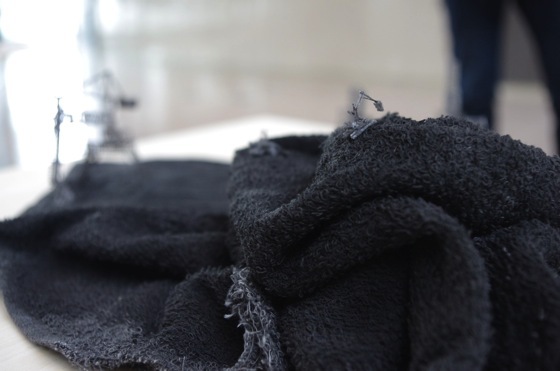 In order to construct buildings that evoke Japan’s industrial rise from its state of defeat in the 1940s, Iwasaki soaked towels in ink, and turned them into rags. These dirtied fabrics, which resembled urban land leveled by an air raid, formed the base of the Kawasaki series. 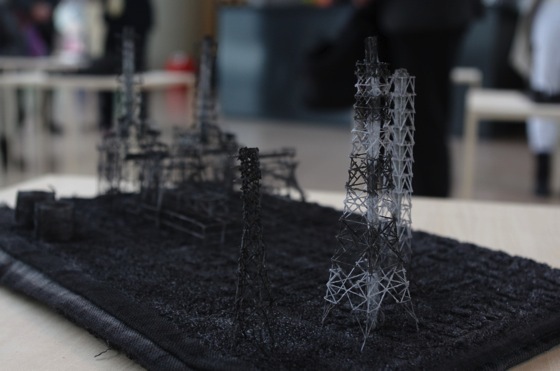 So why does Iwasaki create steel electrical towers, ferris wheels and construction cranes? In an artist talk held at the Kawasaki City Museum, Iwasaki cited manga artist Katsuhiro Otomo (of Akira fame) as an influence on his work. Compared to popular protagonists in other mangas, Otomo’s somewhat plain characters didn’t particularly appeal to Iwasaki when he first read Akira. However, he was drawn to the inanimate objects, background imagery and cityscapes in Otomo’s work. Similar to the way in which Otomo depicts sceneries in his mangas with such detail, Iwasaki sheds due light onto familiar, insignificant buildings that are too often taken for granted. Iwasaki’s partiality for the inconspicuous can also be seen in the way he displays his work. 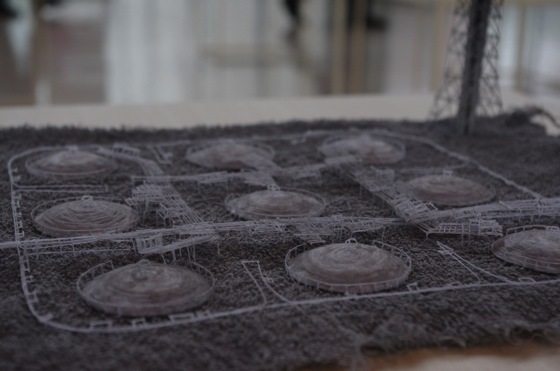 At past exhibitions, like at the 2011 Yokohama Triennale, he has set up his work in obscure corners where they could only be observed through a telescope from the other side of the room. He places great attention on how his work is exhibited, sometimes making them easy to miss! 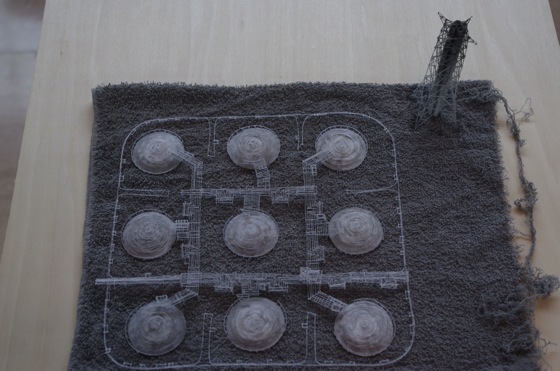 Just as a child uses his imagination to play make-believe or build a fort, the artist uses limited resources to craft very accurate models of reality. There is a well-known tale about the prominent 15th century Japanese ink painter Sesshu, in which the artist as a young boy draws a mouse using his own tears. Iwasaki has expressed admiration towards Sesshu, and he interprets this mouse anecdote as an adage that commends frugality and resourcefulness. When Iwasaki himself was a young boy, his parents ran a bakery and couldn’t always afford to buy him toys. But his mother would get him thick paper used in the clothing store across the street from their shop, so that he could use the paper to make his own transforming robot toys. Like a proper prototype of his later artworks, Iwasaki worked on these paper models by scrutinizing robot toys at stores to make them resemble the commercial versions. These handmade toys were no doubt formative in making Iwasaki the inventive artist he is today. Iwasaki’s use of everyday objects and his impressive dexterity inevitably leads to comparisons with other Japanese artists like Yuken Teruya and the sister duo Akiko and Masako Takada. However, Iwasaki’s works seem to capture a larger landscape with a somewhat melancholy story – scenes frozen in time, snapshots of a bygone era. 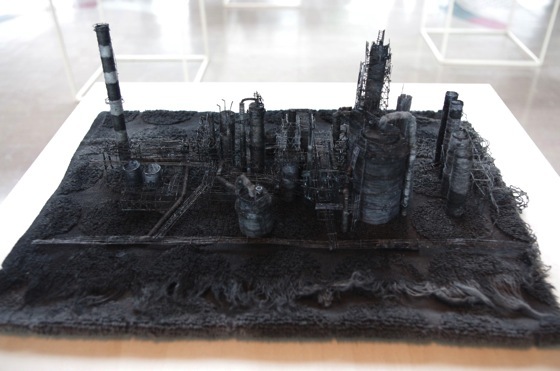 Imagining the historical growth of Kawasaki, the artist pictured Japan’s industrial growth sprouting and multiplying “like fungi.” Factories and plants like the ones in this series invoke a nostalgic image of an older Japan for the artist. These landscapes exude post-war determination. Iwasaki also admitted that he was conscious of the iconic Japanese photographer Daido Moriyama’s works when creating these gritty pieces. Moriyama’s grainy, black and white shots of urban Japan portray a similar era as the one to which these smoky chimneys and metallic towers, representing a sweaty, manual, and industrial Japan belong. 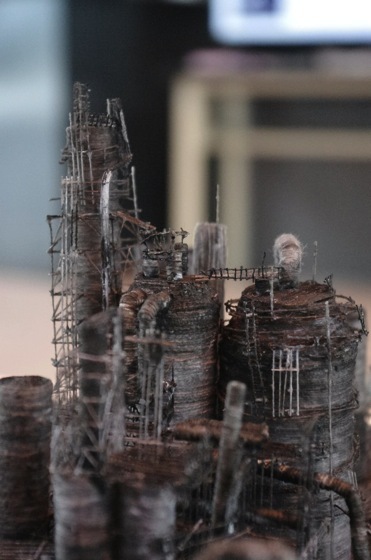 During his artist talk at Kawasaki City Museum, Iwasaki also likened some of the scenic representations in this series, such as the Higashi-Ohgishima LNG terminal and thermal power plant, to extraterrestrial human settlements in science fiction stories, or surviving colonies in a post-apocalyptic world. 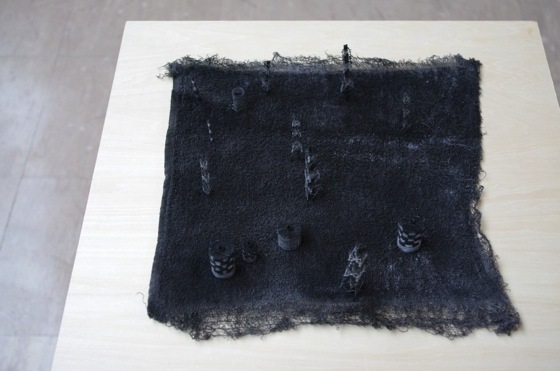 Looking at the nine pieces in this exhibition, they do resemble an empty city abandoned by human activity. Just like Japan’s industrial boom is a phenomenon of the past, Iwasaki fretted that these landscapes will soon disappear. Making these Kawasaki plants and refineries was perhaps Iwasaki’s attempt to preserve a Japan that is quickly fading.